Professional: A brochure, when designed correctly, can help you establish authority amongst your clients and prospects. Brandable: Brochures can easily be branded to your company’s logo and colors. Distributing your brochures will help you build brand awareness and authority. Affordable: Brochures can easily be incorporated into any low-cost marketing plan, especially if you order printed brochures in bulk. You can also print them from your own office printer. Informative: The typical three-fold nature of brochures paired with various visual elements allows you to pack a lot of information into one sheet of paper without overwhelming the reader. Versatile: You can market with brochures online or in-person using physical printed copies. And, they can be given to anyone in your target audience, no matter where they are in your sales funnel. Let us provide you with some suggestions. Due to the flexibility that comes with brochures, there are a lot of ways that you can market with them. Trade Shows: Brochures are a must-have for any trade show that you attend. Service Visits: You can have one of your technicians leave behind a brochure after a service visit to a complimentary service that your client doesn’t yet utilize. Quarterly Business Reviews: When prepping for your next QBR meeting with one of your current clients, you may discover that one or more of your services would benefit the company you will be meeting with. Have brochures for those services on hand so that, if they seem interested, you can leave a deliverable with them to remind them of the benefit that those additional services would bring. Direct Mail: Most brochures are designed to fit in a standard envelope, making them an ideal piece for your next direct mail marketing campaign. 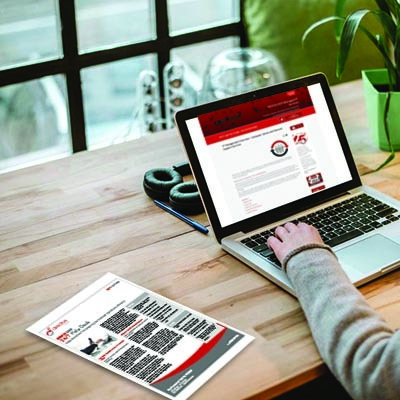 Website: Have a downloadable brochure on each of your service pages so that website visitors can download them to print or save to their device. You can also include them on applicable landing pages. If you have the right tools, you’ll have the added benefit of collecting information about the individual who downloaded your brochure. Social Media: If you put your brochures on your website, you can promote them via social media and link back to your website so interested parties can download them. Email: If you are discussing one of your services with a client or prospect online, in-person, or over the phone, you can ask if they would like to be emailed one of your brochures so that they have the information they need right in their inbox. Local Involvement: In addition to trade shows, you may attend other live events in your local area. When applicable, bring along some brochures so that you have an informative, tangible piece to hand to someone who is interested in learning more about what you can do to help their business succeed. These are just some of the ways to market our company with brochures. When it comes to brochures though, the sky's the limit. Because of this, it can be intimidating to get started using them. Fortunately, our Ultimate MSP Brochure Kit can help you get your foot in the door by providing you with brochures professionally branded to your company logo and colors for each and every service that you may offer. Contact us today to order your kit and get started.